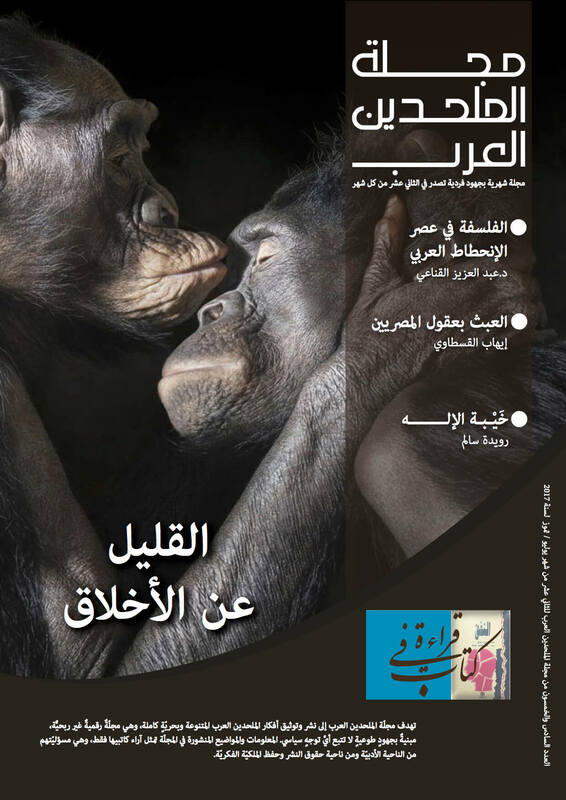 We introduce the 56th issue of the Arab Atheists Magazine‪.‬ This issue opens with a piece by Aziz Alqenaei‪,‬ titled ‪“Philosophy in the Age of Arab Decline”,‬ followed by “Messing with the Minds of Egyptians”; a new contribution by Ehab Elkstawy,‬ then we read “The Neo‪-‬Atheism Wave in the Middle East”‬ by Jesus Zen‪,‬ followed by a the short story ‪“‬Disappointment of God‪..”‬ by Ruwaida Salem‪.‬ Hisham Adam this time ‬reviews how own book‪:‬ ‪“The New Muslims‪:‬ A Critique of Moderate Islam‪”.‬ ‪‬‪Our featured article this issue is by Ta‪’‬ir Hur‪ titled ‪“A Piece on Ethics‪”‬. Ahmad F. Alabbasi then writes about the “Common Misconception” for this time addressing the question “Is Atheism Responsible for the Crimes of Communism!”, followed by the fifth installment of the Arabic translation of Charlie Hebdo’s “La Vie de Mahomet”. Then you’ll read a final installment of Sam Mar’s novel “Fatinah”, and we end as usual with a cartoon by Moussa Eightyzz. We hope you enjoy what we have in store this time.